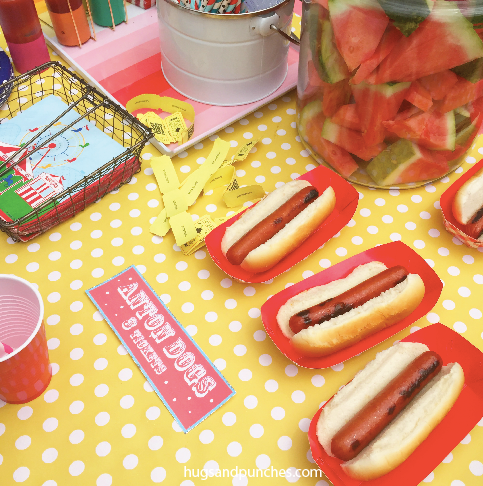 When this sweet eight year old was turning three...we planned a Carnival Bday Party (inspiration here). Not only did it rain, however. IT POURED. So this weekend, years later...we did a redo. And what did the forecast call for this weekend? Every day for the next week, in fact. But we hit our knees hard and prayed like crazy. And The Lord smiled down on Anton, giving him a gloriously beautiful afternoon. Most of the decorations are from five years ago at my last attempt at this party. But some, like this adorable farris wheel cupcake holder are new. Strangely enough he didn't want cake, but instead asked for root beer floats, so I just used it for pretzels. (which our dog is still eating off the grass + patio). I'm a sucker for cute tableware so I was excited to put the ketchup and mustard in these darling holders. Gold + pops of color? Condiments never looked better. We invited whole families over, I always love getting to know our kids parents and siblings better. And to entice the parents to stay...I made sure there was a bucket of adult drinks available. If you've ever been to a crazy kid-party...you know these type of beverages are a must. haha. I'll share the recipe to this yummy grown-up slushy later in the week. Sweet Anton made this ticket holder himself from a leftover box from Costco. He even tied a jack-rope to it so he could hang the box from around his neck like he was selling soda at a baseball game, or something. It wasn't exactly the look I was going for, but since he worked so hard on it (and was beyond proud of his invention), you know I couldn't put it away. As for our patio table, I used wrapping paper as table runner (per usual). I taped a long strand of tickets to the edges as a border, to give it another pop of color. Those adorable pinwheels have made it through multiple moves and multiple uses...I first made them four years ago for Laith's second birthday (which was a Vintage Toy theme). The kids spent the majority of their time on the trampoline, but still had a blast with all the little carnival-type games. And thank the Lord above for SUN! Anton's birthday was admittedly back in April. I could tell you we've been waiting for the weather to warm up so we could have the party in our backyard...but truthfully, it's just taken me this long to plan it. Been there? Yikes. Sometimes having six kids is just crazy. No. It's always crazy, haha. And our schedules are just insane this time of year! Thought I'd put together some fun ideas in case you too are wanting to put a carnival or circus themed party together!! Dressing up plastic animals from the dollar store?! Ohmygosh. SO cute!! If only I had the time and energy to make these adorable cookies!! They're almost too cute to eat! Stop. Just stop. They had a dunk-tank at this party. I mean...did the kids ever leave? I think you'd have to carry me kicking and screaming from a fun party like this. Gasp! Mini funnel cakes?! YES! The coolest. See that apothecary jar behind the darling little girl with the mustache + glasses? We're doing that same thing! I found clown noses on Amazon and will load a jar full of them for the kids to wear around! If you're going to have a carnival...there've got to be games! There are some cute how-to's in the above link. How 'bout making your own mini corn dogs?! And here are some gluten free versions! I love these out-of-the box ideas for tickets. I found a bunch both online and at our local Party City. There are some darling decor items on this site. Especially if you're going for a really themed looking party. There's just something about red and white stripe that says Carnival...doesn't it?! 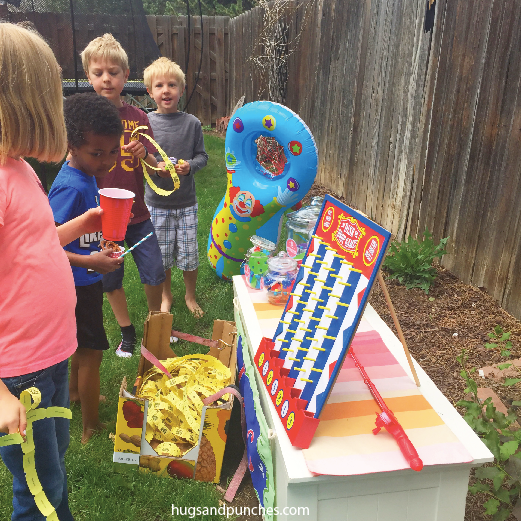 Love this party lemonade stand! How deliciously simple is this idea?! I love how she used fabric draped on the wall behind the table as a mock-tent. And the bunting would be so simple to make, too! Just cut triangles and tape it to string. All these ideas are making me so excited for Anton's party! It's currently hailing/completely pouring outside. So...I guess I need to start wrapping my mind around the idea of being indoors. Darn. But nonetheless it's going to be a fantastic celebration of our sweet 8 year old! !